The requirements of factual description tend to override artiness and the transient fashions of expression. Soldiers’ narratives of the American Civil War, for example, are often hard to distinguish, in point of style, from the prose of the present day. Still life painting, which appeals through the appreciative observation of interesting objects, doesn’t usually cry out its century. 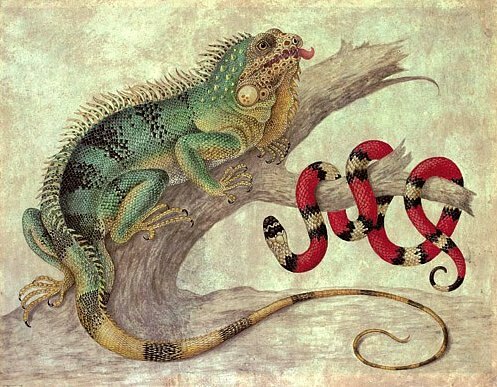 Similarly, this wonderful piece by Maria Sibylla Merian. It’s vivid and full of personality, but there’s nothing about its concept or execution that interferes with its reportorial function, or advertises its date. Merian lived from 1647 to 1717. Who would think it, studying this?